International Journal of Advanced Biochemistry Research is a peer-reviewed journal. The prime focus of the journal is to publish articles related to the current trends in research. Journal Abbr. : Int. J. Adv. Biochem. Res. 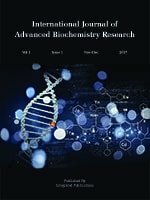 Journal considers review and research articles related to: medical biochemistry, experimental nutrition research, clinical chemistry, free radical research, therapeutic drug monitoring and toxicology, laboratory medicine in general, with the focus on analytical and clinical investigation of laboratory tests in humans used for diagnosis, prognosis, treatment, therapy, and monitoring of disease, biomolecular recognition, protein-DNA interactions, gene-cloning, genetic engineering, genome analysis, gene targeting, gene expression, vectors, gene therapy, drug targeting, drug design, molecular basis of genetic diseases. Your views and comments will be highly acclaimed. 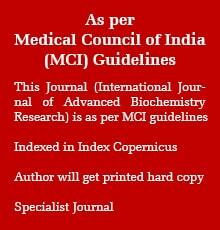 Author can send their articles to biochemjournal@gmail.com or through website Submission Link. All manuscripts are subjected to RAPID peer review process and those of high quality (which are not previously published and are not under consideration for publication by another journal) would be published without any delay in subsequent issues. Online submission of the manuscript is strongly recommended. A manuscript number will be mailed to the corresponding author within one week or earlier.